Dimensions 0.40 by 6.50 by 9.50 in. This book examines the contemporary production of economic value in todayÃ¢ÂÂs financial economies. Much of the regulatory response to the global financial crisis has been based on the assumption that curbing the speculative Ã¢ÂÂexcessesÃ¢ÂÂ of the financial sphere is a necessary and sufficient condition for restoring a healthy economic system, endowed with real values, as distinct from those produced by financial markets. How, though, can the Ã¢ÂÂintrinsicÃ¢ÂÂ value of goods and services produced in the sphere of the so-called real economy be disentangled from the Ã¢ÂÂartificialÃ¢ÂÂ value engineered within the financial sphere? 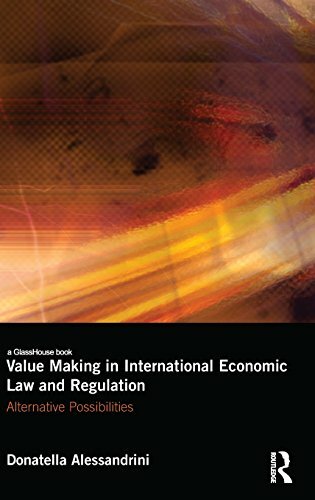 Examining current projects of international legal regulation, this book questions the regulation of the financial sphere insofar as its excesses are juxtaposed to some notion of economic normality. Given the problem of neatly distinguishing these domains Ã¢ÂÂ and so, more generally, between economy and society, and production and social reproduction Ã¢ÂÂ it considers the limits of our current conceptualization of value production and measurement, with specific reference to arrangements in the areas of finance, trade and labour. Drawing on a range of innovative work in the social sciences, and attentive to the spatial and temporal connections that make the global economy, as well as the racial, gender and class articulations of the social reproductive field within it, it further asks: what alternative arrangements might be able to affect, and indeed alter, the value-making processes that underlie our current international regulatory framework? About: This book examines the contemporary production of economic value in todayâs financial economies.